Personality: Kara is a very silent person and doesn't like to talk he is kinda shy and cold-hearted and doesn't think of others feeling but not on purpose socializing is "New" to him. You could usually see Kara in a library reading on mythology or music Kara plays the piano on his free time and is really good at it Kara is a puppeteer and his puppets name are Love and Hate a bird like puppet with wings that are made of needles. While fighting Kara will go all out and will protect his friends even if he never spoke a word to them he is a confident in his ability to fight but will shy out if things get too tough but overall Kara will fight to a certain point. 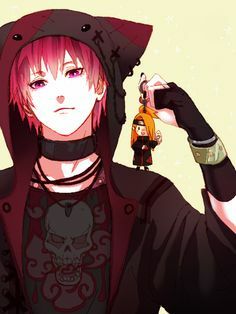 Appearance: Kara has orange hair and wears a gray shirt and a hood to hide his messy hair he has two different eyes that are blue and red he wears black glasses red shoes with black laces and black earrings with a pocket watch hanging out of his pants. his puppet is two twin birds that look exactly the same except for the colors one is bright colored and one is dark colored symbolizing their names. Bio: Kara Yamanka was born as a mind based ninja but he loved playing with puppets and others like it and soon taught himself the chakra strings and made his own small puppet with secret toy weapons in it the puppet was similar to a dragon and it was a deadly weapon if it had real weapons inside of it because it breathed knives and could fly by wind justus. A lot of his family members disapproved of Kara and shut him down making him feel like he was nothing so he stopped talking and separated himself from other kids and spent his free time building puppets based on mythology figures. His latest one was based on Birds that were built for battle and he swore to prove to his family that he is useful. They are two twin birds that he controls with two finger one on each a hand to confuse his target. Kara was walking in the forest to his surprise thieves were about to rob him but since Kara was a fast ninja he quickly called his twin birds Love and Hate were summoned into battle he then put his chakra strings into the puppets and contoled them both with one finger each. There where three thieves and Kara knew exactly what to do he was going to take two of the him Hate since hate was stronger then love and keep the other one off of Kara with Love as Love was built for defense he used the secret knives that were hidden inside of Hates beak and subdued one of the victims as hate went for the second one and Love was swiftly pecking at the other ninja. Hate used a net that was hidden in the back of the bird and immobilized the thief as he went for the last ninja this was going to get interesting now that Love and Hate were together they made a powerful combo attack called Harmony where Love would distract the target while Hate would swoop in and attack and if he ran Love would chase him until they finally got him they man ran away from Kara for he was too much for him and he couldn't take it. Kara smiled and strolled back into town looking for a place to rest as Love and Hate were flying behind him.